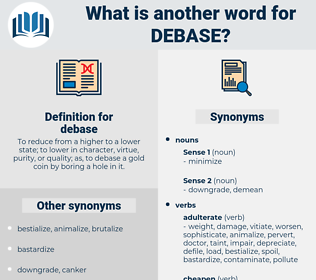 What is another word for debase? 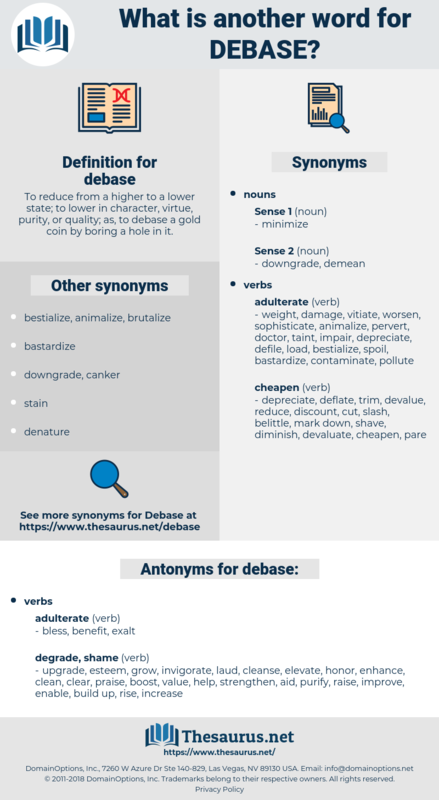 To reduce from a higher to a lower state; to lower in character, virtue, purity, or quality; as, to debase a gold coin by boring a hole in it. upgrade, esteem, grow, invigorate, laud, cleanse, elevate, honor, enhance, clean, clear, praise, boost, value, help, strengthen, aid, purify, raise, improve, enable, build up, rise, increase, dignify, assist. spotlight, enshrine, cite, commend, advance, salute, romanticize, applaud, lift, eulogize, refine, restore, tout, ensky, fete, recognize, highlight, compliment, uplift, enrich, idealize, decorate, hail, congratulate, canonize, cheer, acclaim, extol, ennoble, perfect, respect, glorify, celebrate, enthrone, acknowledge, boast, clarify, deify, magnify, aggrandize, play up. deep-six, daybook, die back, dative case, De Bakey, depose, dubuque, davys, devious, debs, diadophis, debauchee, dipus, dipsacaceae, dabchick, deep-sea, daviesia, dybbuk, deedbox, dibbuk, devices, devoice, date back, du bois, debug, doofus, devise, diffuse, defog, diaphysis, debauch, debussy, dubious, daboecia, deific, dipsacus, dieback, database, deface, ditty bag, debouch, devisee, deep kiss, defuse, davis, device, Dovish, dovekie, day book.